The website is owned by KiddieMatters. The information provided in or through this Website is for educational and informational purposes only and solely as a self-help tool for your own use. The information provided is not meant to replace the advice of trained mental health professionals. Kiddie Matters does not, under any circumstances, advise you to discontinue or to avoid medical or psychological consultations. You should always refer to child’s pediatrician or mental health provider if you have concerns, are in doubt or have any kind of medical, mental or other condition. Don’t use these techniques to try to solve a problem where your common sense would tell you it is inappropriate. Since these are self-treatment techniques, we cannot and will not take responsibility for what you do with them. 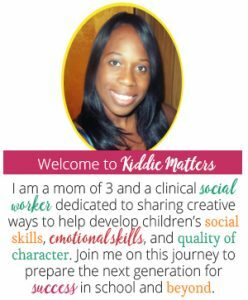 My goal at Kiddiematters.com and in The Social Emotional Tool Box is to provide helpful tips, tools and tutorials for parents, counselors, and educators. I cover topics such as social-emotional skills, positive parenting, executive functioning skills, and self-esteem activities. Separate from my affiliate relationship and advertising network, I do sell products of my own on Teachers Pay Teachers that I write about on the Website. All of these products are created by me and their profits come directly to me. By using this Website, you agree to absolve me of any liability or loss that you or any other person may incur from use of the information, products or materials that you request or receive through or on my Website. You agree that I will not be liable to you, or to any other individual, company or entity, for any type of damages, including direct, indirect, special, incidental, equitable or consequential loss or damages, for use of or reliance on my Website. You agree that I do not assume liability for accidents, delays, injuries, harm, loss, damage, death, lost profits, personal or business interruptions, misapplication of information, physical or mental disease or condition or issue, or any other type of loss or damage due to any act or default by me or anyone acting as our agent, consultant, affiliate, joint venture partner, employee, shareholder, director, staff, team member, or anyone otherwise affiliated with my business or me, who is engaged in delivering content on or through this Website.